Interactive fiction’s history both intersects and acts as an alternative space to modern game development—even indie, narrative-based development—with its own unique traditions and community standards. One of the most prominent is “comp,” which could also be a “mini-comp” or a “speed comp.” Most were small, one-shot affairs with perhaps a few games entered, while others became stalwarts in the annual IF calendar. It’s in this context that one of the most important early mini-comps, 2001’s SmoochieComp, “a reviewed competition for short games with a plot focusing on love or romance ” should be evaluated. 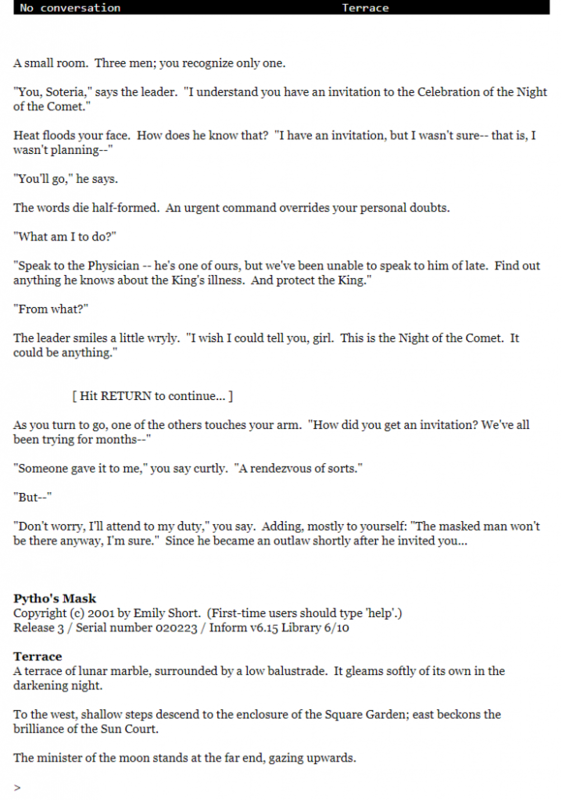 It cannot be underestimated how romance was a rare beast in interactive fiction for a long while. Besides the Infocom game Plundered Hearts, there are a few notable exceptions in late-90s/early-00s IF with romance in games by Christopher Huang, Kathleen Fischer and Liza Daly. But SmoochieComp stands out as an important milestone. And one of the best games from that comp was the one created by its organizer, Pytho’s Mask by Emily Short. Pytho’s Mask, though not perfect (I wished that the feminist themes running throughout this piece were pushed up from the subtext a bit more), is nonetheless a gem. It’s one of Emily Short’s lesser known games but the dynamism between the conversation system, the landscape, and kinetic action with the parser is as deeply satisfying as any of Short’s longer games. The game has a lot of intriguing characters to talk to, and the map is neatly made but never feels too constrictive. As a woman and member of the Order of the Phoenix (the, er, novel of the same name came out in 2003), you’re tasked with discovering the nature of a plot against the King in an astrologically regimented royal court. You received an invitation to the Night of the Comet celebration, and the story pieces itself together the more you talk to people in the court: the comet at its apogee can create momentary chaos, and the entire social order might be upended. There’s also a masked man of a swashbuckling persuasion in your past, and a prince who seems to have taken a keen interest to you. There a lot of moving parts in such a short game, but for the most part it all hangs together. As the motivations of those in the court become clearer, the game does a great job of increasing the urgency. When it comes to moving inside a space and having to balance action with figuring things out, it’s hard to beat parser interactive fiction when it’s working well. The conversation system also warrants special attention, though occasionally it got a little finicky. (I would keep a walk-through handy if you get a bit stuck.) It blends topic-based and menu-based conversation, and the snappy flow of talking back and forth lends itself to your character feeling a bit in over her head, but at the same time being constantly underestimated by the men around her. It’s tempting to say that we’ve “evolved” a great deal in the last 17 years. But in hindsight creating a game like Pytho’s Mask, in a comp geared specifically for romance and love, was a revolutionary act in its time. Hell, here in 2018, creating a game with real female agency still feels like a revolutionary act in many quarters. We can learn a lot from games like Pytho’s Mask, and from SmoochieComp, when—let’s be perfectly honest—we need games about love now more than ever. Anya Johanna DeNiro’s works of IF have included Solarium, Deadline Enchanter and A Bathroom Myth. She can be reached on Twitter at @adeniro and her Patreon is http://www.patreon.com/adeniro.